The CSV file import function allows you to quickly and easily import large voter lists. Typically, this method is the best method to use if your voter list exceeds 5000 voters. Electionbuddy provides you with a CSV template to use for your voter list — we strongly recommend using it, as this template will tell you exactly what information you need for your file, and will help ensure that your CSV is accepted by Electionbuddy. This template should be opened in a program like Microsoft Excel. Click on the CSV template link, indicated by the red box in the image above. The highlighted text in the image above indicates the information required for your voter list, and the order you must put it in. This is especially helpful if you choose not to use the CSV template! Please note that your voter list may not require all of the above information — Electionbuddy will show you only the headers that you need to have for your election specifically. The CSV file importer has extremely specific requirements that must be met with regards to your data organization; if the requirements are not met, your file will not upload. Your voter information headers must be exactly the way you see them presented (i.e. the highlighted text in the image above). That means if you're running an election with ballot IDs and email notices, your headers must be "ID" and "Email", in that order. The capitalizations must exactly match the Electionbuddy table. 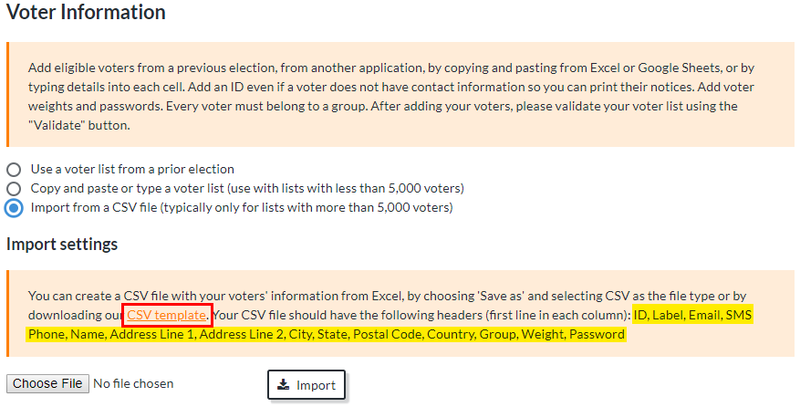 If you have any data in the Excel sheet that does not fall under a header, then Electionbuddy will think that a header is missing and will reject your CSV. You must ensure that you have no non-printable characters. A non-printable character is a hidden character that you can't see. They are commonly applied in word-processing programs, often without your knowledge, and are used for formatting. These are bad for your CSV. Excel has a specific function to remove non-printable characters. It is calld the =CLEAN() function, and you can use this to clean up your CSV. For more on how to use this function, please see Microsoft's help article on the CLEAN function. Mailing addresses have very specific formatting around them, including required/optional fields and specific character limits, see Mailing Address - formatting tips for more details. On the "Voters" page of your election setup, scroll down to the "Voter Information" settings. Choose "Import from a CSV file". Click the "Choose File" button, and select your CSV file. Give it a few minutes, especially if your voter list is quite large. You know it has worked if the voter list appears with all your voter information inserted in it; Electionbuddy will tell you if the upload failed. If your import failed, please review the above tips to ensure that your CSV file was properly formatted, or try copying and pasting your voter information into Electionbuddy instead.